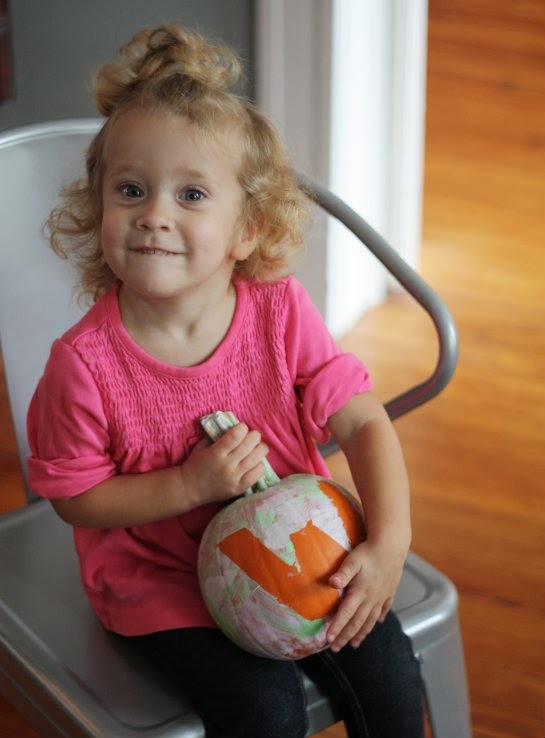 Our youngest niece, Sophia, stayed with us over the weekend. She's just over 2 years old, full of energy and sweet as can be. 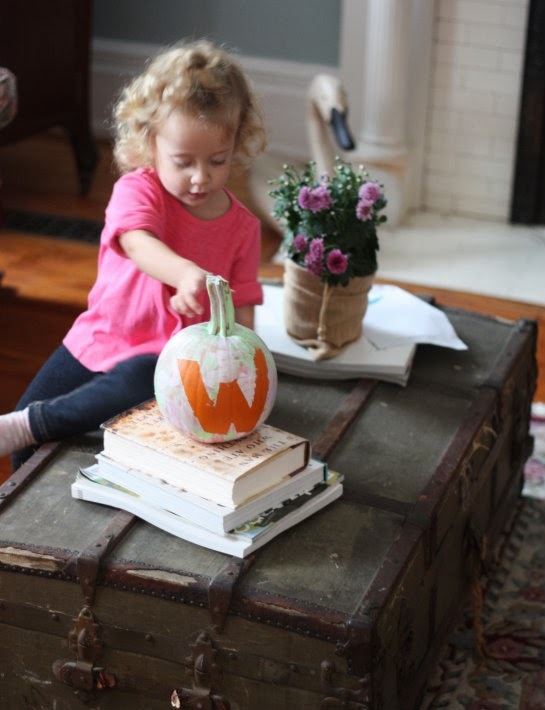 We'd planned a couple indoor activities since it was expected to be a rainy weekend and painting her very own family pumpkin turned out to be one of the biggest hits. 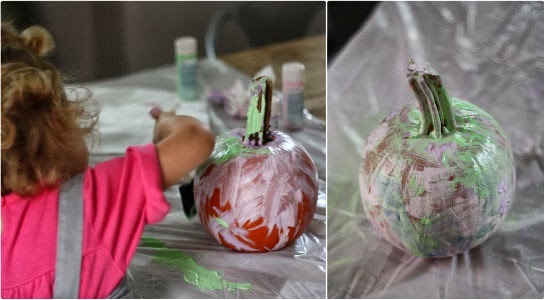 I'd remembered when John & Sherry from Young House Love made a painted letter pumpkin with their daughter when she was a year old and drew inspiration from the idea of letting Sophia get a little messy, then peeling away the layers of painter's tape to reveal the final design. 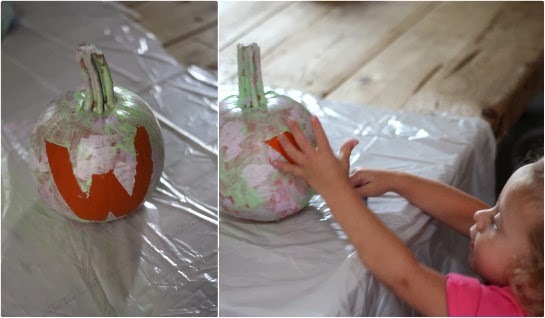 The basic idea here is to create your letter, shape or design with painter's tape, allow your little one to get as messy and creative with the paint as they like, then peel away the tape to reveal a clean design against the paint. 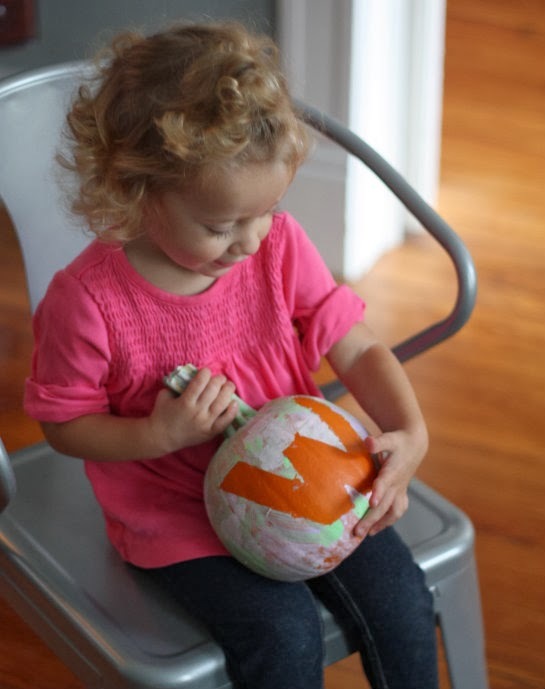 She loved painting over the taped letter and kept chatting with me about how she was painting all over it. I'd decided on the letter W beforehand since it's the letter of her family's last name. 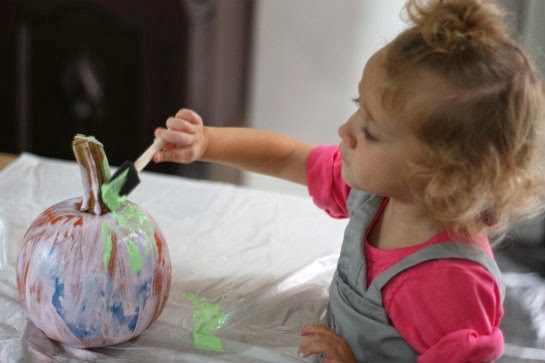 With 2 siblings so close in age, I kept thinking if she returned with a "family" pumpkin rather than an "S for Sophia" pumpkin it might help cut down on any jealous feelings. 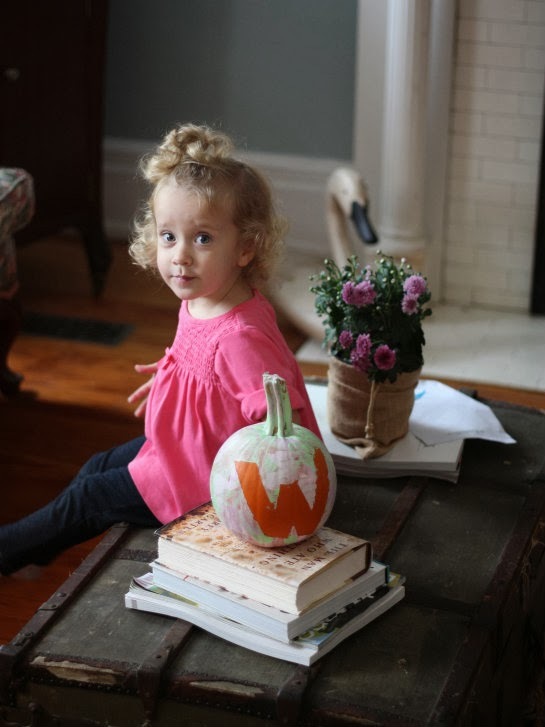 Plus, it gave us lots of good conversation about how to pronounce the letter W, talk about how it stood for her family's last name and talk about the other letters that make up her and her siblings' names. I'd also picked out 3 colors from the big Martha Stewart collection I had on hand. I figured 3 would give her a fair amount of choices and let her decide which to choose first, second and third. Having 3 separate foam brushes for each paint color was a time and mess save for me. You can probably tell I'm the aunt to this child since we used one of Tim's man-sized aprons to wrap all around and protect her, ha. 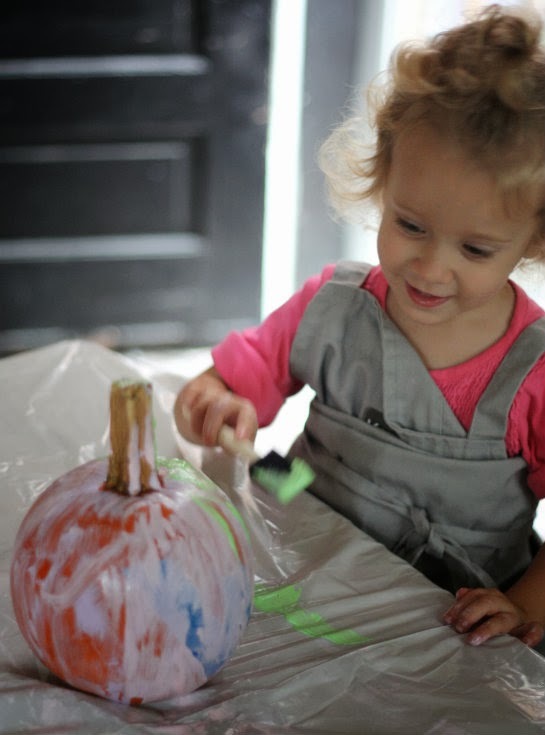 DIY kids aprons need to get on our list of projects, asap. Speaking of protection, I basically cut open a big trash bag and placed it over the table as the work surface. 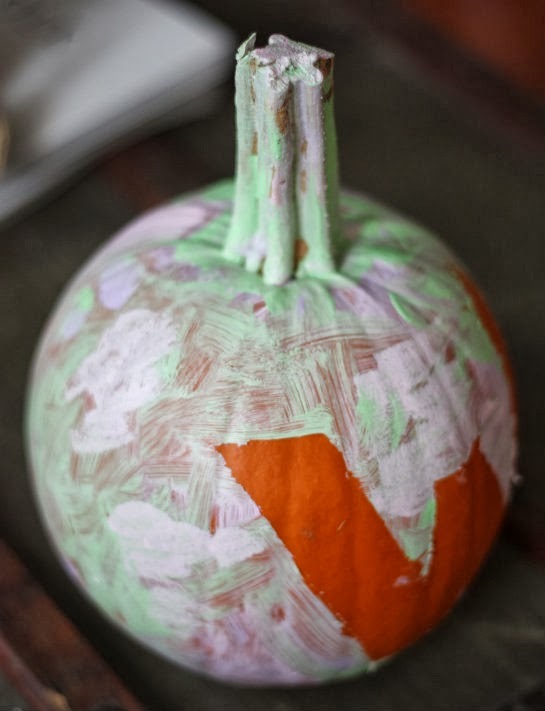 It made for an easy surface to squeeze and wipe away paint, then just toss the whole thing away when we were finished. The 3 colors seemed to be the perfect blend of giving her enough options and choices to work with without overwhelming her or creating that all too well known muddy mix of every color. I think it turned out really well. 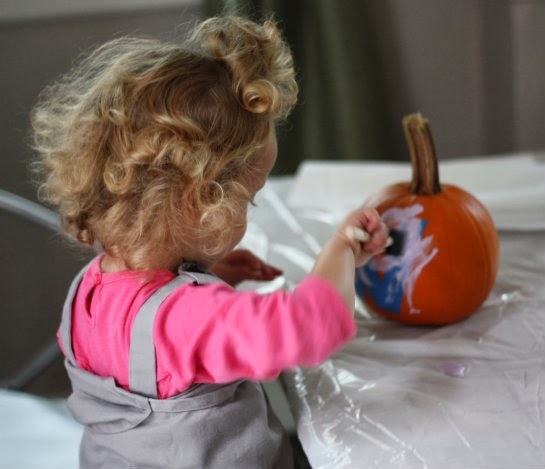 We've got plans to head out to a local pumpkin patch with the lot of all 3 kids next week, so there should be more pumpkin adventures to come! P.S. 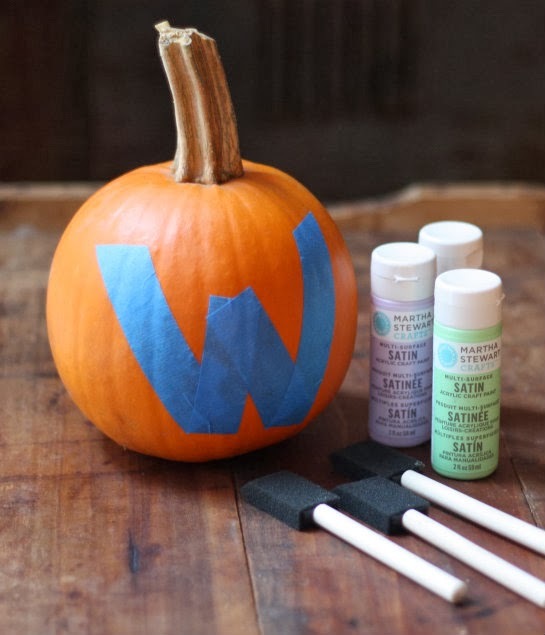 This post was brought to you today by the letter W.
What a fun project for her. She is such a cutie! Oh that's a really cute simple idea. It's nice too that it's easily suitable for a range of ages.